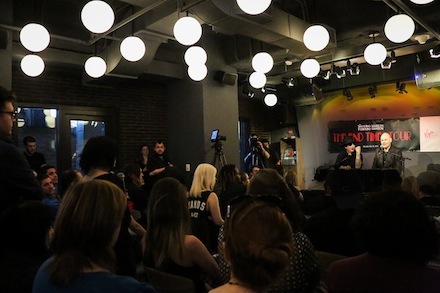 On Monday, May 18th, Billy Corgan of the Smashing Pumpkins and Marilyn Manson held a live streamed press conference from a private venue on the 25th floor of the Virgin Hotel in downtown Chicago. 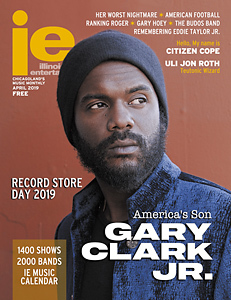 The intimate event, open to a select number of early attendees and contest winners, came in advance of both artists’ forthcoming The End Times summer tour. Over the course of an hour, the two frontmen fielded questions from an audience of fans and press, with topics ranging from plans to cover Cyndi Lauper’s “Girls Just Want to Have Fun” together on tour to Manson’s apparent penchant for listening to Justin Timberlake before performing. Manson also recalled his very first encounter with Corgan, when the Pumpkins frontman called a studio looking for Trent Reznor, and Manson was on the other end of the line, filling in that day for Richard Patrick on guitar. Most apparent throughout the discussion was the mutual respect both artists hold for each other. “We’re almost like brothers. We kind of understand each other in a way that I think very few people understand us in the world,” Corgan revealed early on in the conference. “I’m like the eleventh grader, (Corgan’s) like the twelfth grader I look up to,” Manson later affirmed. For two artists with such often grave personas, the conference often showcased the a seldom seen lighter side and sense of camaraderie, especially unexpected from Manson, who’s built a career out of playing a boogeyman. When the topic of nostalgia in the live arena came up, Corgan stated “If people want to attach nostalgia to (our concerts), they don’t really understand what we’re about, anyway.” Other revelations included that Corgan taught Manson how to play guitar, and that Manson identifies “Lamb Of God,” off his 2000 Holy Wood full length, as the work of his that’s most meaningful to him. For more from the conference, check out the full live stream video in this article. And catch Smashing Pumpkins and Marilyn Manson in Chicago for The End Times tour on August 7th at FirstMerit Bank Pavilion at Northerly Island.